Acne is a condition that is brought about when the sebaceous glands become obstructed; this causes pimples, and sometimes deeper cysts or nodules to form on the patient’s face, neck, chest, back, shoulders and upper arms. Acne usually starts in adolescence and commonly affects most teenagers at one time or another. However, adults can also suffer from acne. When severe, acne can often result in scarring. Even less severe cases can lead to scarring, if not properly treated. The treatment of acne is important in ensuring that the damage of caused by this skin problem is kept to a minimum – or at the very least, controlled to prevent serious outbreaks and unattractive acne scars. Laser acne treatment reaches into the deeper layers of the skin to treat acne at its source; some laser therapy treatments are known to damage the sebaceous glands so that they produce less oil. Laser acne treatment can effectively treat acne without harming the outer layer or surface of the skin. Woodbury Dental and Laser Clinic in Kent uses Harmony AFT treatments to address acne problems, as well as acne scar concerns. This laser treatment consists of eight brief treatments spread over a period of four weeks, which is all it takes to significantly improve a patient’s acne. 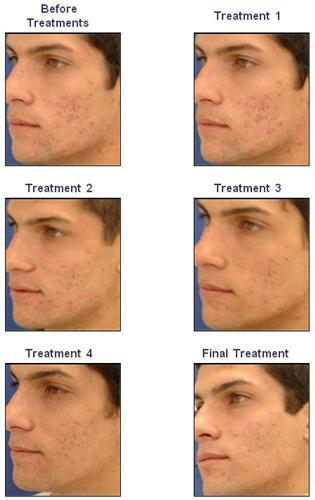 The effects of Harmony AFT laser treatment are three times faster than the effect of common antibiotics for acne. Harmony™ AFT treatments for acne are perfectly safe and have no adverse side effects; the patient will also experience no discomfort whatsoever. Patients will be able to see results right away, with majority of the patients achieving 80% of acne clearance in a span of just four weeks. Harmony’s AFT acne treatment is done very quickly, and is finished in usually just three minutes; this is because the laser treatment is used only in the affected area. Other acne phototherapy treatments deliver extremely low doses of blue light spread out over 10 – 20 minutes per session, which is the reason why these treatments are done for a longer period of time. Harmony’s AFT acne treatment uses a higher concentration of similar wavelengths, delivered only to the infected areas. While the dose is similar, the treatment is much faster. Laser acne treatment is non-invasive, which eliminates the experience of discomfort for the patient. Other acne treatments that are invasive in nature can cause a great deal of pain or discomfort for the patient, causing anxiety, and an unpleasant overall experience just to treat the acne problem. There are even some acne solutions or treatments that can cause serious side effects, such as liver problems and serious birth defects; Harmony AFT acne treatment eliminates the possibilities of encountering those adverse side effects. Harmony’s AFT acne treatment can be done in just a few minutes, as it targets the infected area directly. The quick treatment time leaves the patient with more time to go about his or her daily life activities, without causing too much interruption to a hectic schedule. There is zero down time needed after a laser acne treatment, and the patient can immediately go back to regular activities after the treatment session – some patients can even schedule the laser treatment during the lunch break, and go back to work afterwards without any difficulties. Laser acne treatment in Kent produces results in cases when traditional acne medications or treatments have failed, and takes away the hassle of having to monitor the daily or regular intake of medications for the acne problem. Visible results from the laser treatment can be seen right after the treatment; patients can see the difference in the way their skin looks like after just one session. Other acne treatments, especially medications, can take weeks or months to produce the necessary (and visible) results. The effects of laser acne treatment lasts for a much longer period of time – roughly two years; this is significantly longer than the results that come from other acne medications of treatment options. Laser acne treatment by Harmony AFT deals with acne problems by treating the root cause – and not just the visible effects of this skin problem. Laser acne treatments can reach deep into the layers of the skin to produce improvements in the way the sebaceous glands produce oil, to address the underlying cause of acne. Laser acne treatments also deal with skin bacteria, which, combined with the over production of oil, contribute to acne development.